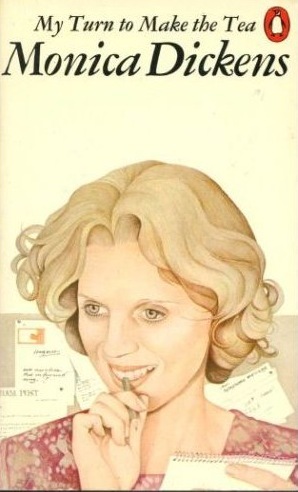 Fiction – paperback; Penguin; 222 pages; 1977. For two-and-a-half years, in the mid 1990s, I was a reporter on a provincial weekly newspaper in Australia. It was my first job as a journalist — and I loved it. So many interesting and off-the-wall things happened during that time that I often thought one day I’m going to write a book about this*. Alas, Ms Monica Dickens has beaten me to it! My Turn to Make the Tea was first published in 1951. It has a distinctly autobiographical feel to it (Dickens, who just so happens to be Charles Dickens’ great grand-daughter, did work as a newspaper reporter for a short time and later became a columnist for Woman’s Own magazine) and reads very much like the diary of a young reporter learning the ropes. There’s no real plot of which to speak, but it doesn’t seem to matter, because this is a witty and wholly entertaining story in its own right. Dickens expertly conveys all the petty drama of working in a newsroom, but she’s a dab hand at revealing the ups and downs of living in a boarding house populated by a cast of wonderful characters and ruled by a strict take-no-prisoners landlady. The book opens with our narrator (dubbed Poppy by her colleagues “for no better reason than that a Sunday paper was running a crude cartoon about a blonde called Poppy Pink”) apologising to a disgruntled reader who’s turned up in the reception of the Downingham Post complaining “you’ve made a libel of me. […] I could sue, you know.” The gut-wrenching fear that this evokes in a rookie reporter is palpable, and not helped when she confesses to her fellow reporters that she needs to print an apology in the next edition. “Apology?” said Vic. “You’re for it. The old man [the editor] hates putting them in. Says it’s the hallmark of second-rate journalism.” He imitated Mr Pellet’s crusted accents to the life. “I said, he hates putting in apologies,” repeated Vic, who could be annoying when he liked. They laughed scornfully. The editor saw every word of copy that was written. Indeed the editor, Mr Pellet, is the quintessential newspaper editor of the time, prone to high blood pressure, a raging temper and very strong views about journalism. But to Poppy he doesn’t look like she expects an editor to look. She describes him as looking like “a man who prods pigs with a stick on market day” and later goes on to confess that he is the “most unliterary-looking person I had ever seen” . Journalism is not literature, he was always telling me. I thought it ought to be, although the others downstairs told me that when I had been there as long as they had, I wouldn’t waste my time thinking up original adjectives which the old man always replaced with some of the tried favourites from stock. The book largely works by showing how Poppy’s misconceptions about journalism fall by the wayside as the practicalities of producing a weekly newspaper fall into place. This was in the day when reporters carried out all their reporting in person — not by telephone or email — and everything was written up by hand or using the office’s sole clunky manual typewriter. Later, Poppy has grand ideas about introducing a woman’s column or making up letters to the editor that would be of interest to a female readership. But these are shot down by Mr Pellet before they even get off the ground. Oh, how very true this all sounds! My Turn to Make the Tea is fairly light and fluffy stuff, but its packed with terrific characters and a lot of humour. Despite being set in the early 1950s, it reminded me of my own stint working on a similar type of newspaper, and later, of training graduates who thought they were journalists because they could write well, not realising that journalism is less about writing and more about fact gathering. I reckon anyone considering a career as a reporter should read this novel first — it will entertain and enlighten more than any text book about the media. Actually, Philip, I’m pretty sure that it was your post that first alerted me to the book. I bought a second-hand copy about a year or more ago. So many thanks for recommending it! This sounds like something I’ll really enjoy. Thanks for the recommendation. Currently reading “When you look like your passport photo, it’s time to go home” by Erma Bombeck. The book is written in a style quite similar to My Turn to Make the Tea.. Thanks for your comment, Joanna. Good ol’ Erma Bombeck, eh? I’d forgotten about her. I did once read a collection of her writings — can’t remember the title now — but it was all stuff about living in London and it was rather hilarious. This sounds like a wonderful book, one that both for work and just for the joy of it makes it one to add to my never ending list of books to by in 2011. Its nice to have a gentle gem like this to read now and again. The good thing about this book, Simon, is that it wont break the bank should you choose to buy it. I picked mine up for 1 pence (plus postage) from Amazon marketplace. I;m pretty sure I read this in the late 60s/early 70s, when I also read her memoirs, One pair of hands and One pair of feet I think they were called. She’s a funny writer – funny ha-ha I mean! I think I will eventually read some of her other stuff. She seems to have done some interesting jobs at times, particularly as she came from a very priviledged background and could quite easily sat back and let someone else provide for her. I think I’ll be picking up a copy of this, Kim, but first I’ll be reading my copy of Mariana. Thanks for pointing me to your review. Sounds like a fun read, and hopefully, I’ll pick up a copy soon. You can get copies ultra-cheap online. I picked mine up for only a few pennies! Thanks, Philip, I remember reading about this when I first published this review. It’s a great story, isn’t it?